Good to see Brendan Burke scoring for Rotherham on the Rugby Club last night. Apparently he is going well and has played centre, full back as well s wing this season..
Last edited by El Diablo on February 4th, 2016, 12:37 am, edited 2 times in total. Rotherham's team is absolutely packed with ex-AIL and fringe provincial players and they're going very well in division one. If they go up there'll be a lot more Irishmen in the GP. Munsterboy wrote: Rotherham's team is absolutely packed with ex-AIL and fringe provincial players and they're going very well in division one. If they go up there'll be a lot more Irishmen in the GP. Think it's unlikely they will go up though. Premier Rugby (or whoever runs the GP) has very strict rules about size of grounds, primacy tenancy, etc. There are teams currently int the GP (LI, Wasps & Bath spring to mind) that wouldn't make the criteria if they got relegated. I think it's only Leeds who do. Not sure what plans Roth have, if any, to get round it. Would they not use the same plans they had last time they went up? Or has the rules being increased? Can't remember the exact rules, but it's at least 10,000 mostly seated. If you share with a football club, you have to have primacy of tenure, and there are other daft rules too. I'm not sure if the community programme is also included, and you have to have a groundsman called Keith. claire_m wrote: Can't remember the exact rules, but it's at least 10,000 mostly seated. If you share with a football club, you have to have primacy of tenure, and there are other daft rules too. I'm not sure if the community programme is also included, and you have to have a groundsman called Keith. Ok, but have these rules being changed or altered i.e. the ground capacity? Can't find them. All I can see is that the clubs have all signed up to them. There is deffo one about the ground capacity, and there are other things that the clubs need to do, but I don't know what they are. I think they're set in stone until 2009, but I think that Leeds are the only club who definitely meet them. Some of the other clubs may, but I'm pretty sure it's only Leeds. El Diablo wrote: Good to see Brendan Burke scoring for Rotherham on the Rugby Club last night. Apparently he is going well and has played centre, full back as well s wing this season..
...not to mention doind video analysis for them too! I've seen him play at full back quite a few times, and was always impressed. I even saw him play no.8 for a short spell in one not-so-serious game! I see Ben Gissing was sin binned last night against the Ospreys. El Diablo wrote: I see Ben Gissing was sin binned last night against the Ospreys. Again?! He was cited after the match last weekend — I thought he would have been on his best behaviour this time around. Shane Jennings had a stormer for Leicester at the weekend. 2 tries and set up at least 1 more. Long term replacement for Gleeson? Bring him back (along with Leo Cullen) please. They know if they want to play for Ireland they have to come back. I see Niall Treston is starting regularly for Coventry in Division 1 in England (along with Mike Walls the former Connacht scrum half). It would be great to see him back. 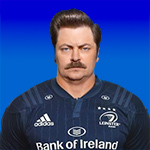 He is 100% Leinster and was hotly tipped to be the next big Irish prop until the leg break a few years ago. El Diablo wrote: I see Niall Treston is starting regularly for Coventry in Division 1 in England (along with Mike Walls the former Connacht scrum half). It would be great to see him back. He is 100% Leinster and was hotly tipped to be the next big Irish prop until the leg break a few years ago. Mullet is playing at a higher standard than he is quite frankly. Oh dear Eoghan Hickey had a bit of a shocker tonight. He cost Munster the game with his missed kicks and the charge down that eventually lead to the Dragons try. Not good for the confidence. Good to see the Bomber still going strong though. El Diablo wrote: Oh dear Eoghan Hickey had a bit of a shocker tonight. He cost Munster the game with his missed kicks and the charge down that eventually lead to the Dragons try. Not good for the confidence. What made it worse was the fact that after coming on as a sub, he was subbed for BOMMER! Why was Bryce Williams at the Dragons-Munster game on Friday night? Fancying a move to Newport maybe? Thought that Kidney made a big mistake bringing on O'Meara for Hickie. Hickie had a nightmare, but his replacement was no better. All that has happened is that Hickie's confidence is probably shot. Location: J'habite a Rouen maintenant. Leinsterman wrote: Why was Bryce Williams at the Dragons-Munster game on Friday night? Fancying a move to Newport maybe? Nice guy. He must still have the scars from playing against O'Connell and O'Callaghan on Black Sunday.